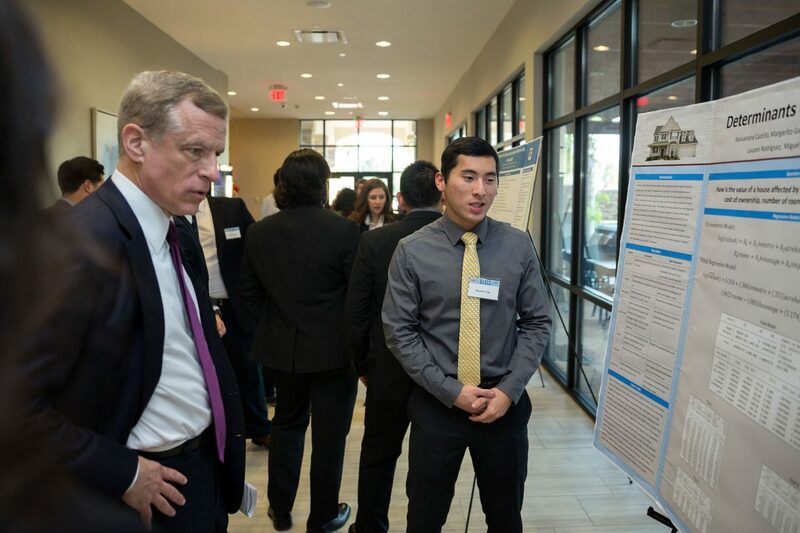 UTRGV student Brandon Lau talks about his group's research project with Robert Kaplan, Federal Reserve Bank of Dallas President and CEO, during the Border Economic Development and Entrepreneurship Symposium (BEDES) hosted by UTRGV, the Federal Reserve Bank of Dallas, San Antonio Branch, and the McAllen Chamber of Commerce on Friday, Dec. 1, 2017 at the Embassy Suites in McAllen. McALLEN — As Mexican shoppers have spent less money in Texas in recent years, Robert S. Kaplan urged the state, and country, to not look elsewhere. That’s not only because the United States relationship with Mexico is murky, but because having strong ties with the southern neighbor is in the best interest of the country. As president and CEO of the Federal Reserve Bank of Dallas, Kaplan knows the value of the Mexican commerce coming into the country. Specifically, he tracks foreign spending in the Rio Grande Valley, and knows how valuable it is to the region and the state. He emphasized a strong relationship between the two countries on Friday during a University of Texas Rio Grande Valley symposium at the Embassy Suites Hotel. As the North American Free Trade Agreement renegotiation trudges on, with no end in sight, and threats from President Donald Trump to pull out of the two-decade-old pact, Kaplan said that would be unwise. Kaplan is also acutely aware of the importance of maquiladoras to this region. One of Kaplan’s chief principals is pushing educational attainment in America, which he said concerns him greatly. Similarly, Mexican maquiladoras are experiencing a tentacle of that education problem with its workforce, he said. First, wage levels concern maquiladora owners, Kaplan said, which affects communities and institutions, especially education levels. Kaplan referenced his time living in Asia where he saw multiple countries — South Korea and Taiwan — endure similar transitions where people relocate jobs.